David and I attended sacrament meeting today. They hold it right here at the hospital. It was one of the most spiritual church meetings I have ever attended. It is so humbling sitting in a room with people that are going through hard (if not the hardest) trials of their lives. I am so thankful for the people that dedicate their time to serve there. This trial in my life has truly opened my eyes to others and their situations. Little Oliver’s situation doesn’t seem so bad compared to what others here are facing. There is a sweet little family that has passed our room here a few times. They are pulling their little boy in a wagon. I recognize the mom. She is part of the Facebook heart group I am a member of. This family is the Walker’s. Teisha, this young boys mother, has become some one I really look up to. She doesn’t know this, but her story has touched my heart, and these pictures are forever ingrained into my mind. Teisha kindly agreed to share Tytan’s story here on Oliver’s Twist. Their story is one of great faith, courage, and heartache. Read about it in the following post titled “Tytan’s Story”. “Hard times will always reveal true friends.” Sadie and I met under extremely stressful circumstances but I am glad I get to call her my friend. She gave me hope when I felt like I was drowning. Ollie had just had surgery and Finn was waiting for his first. Ollie was Finns first roommate. Sadie and David shared a pizza with me on a particularly hard and lonely night and I appreciated them thinking of me. 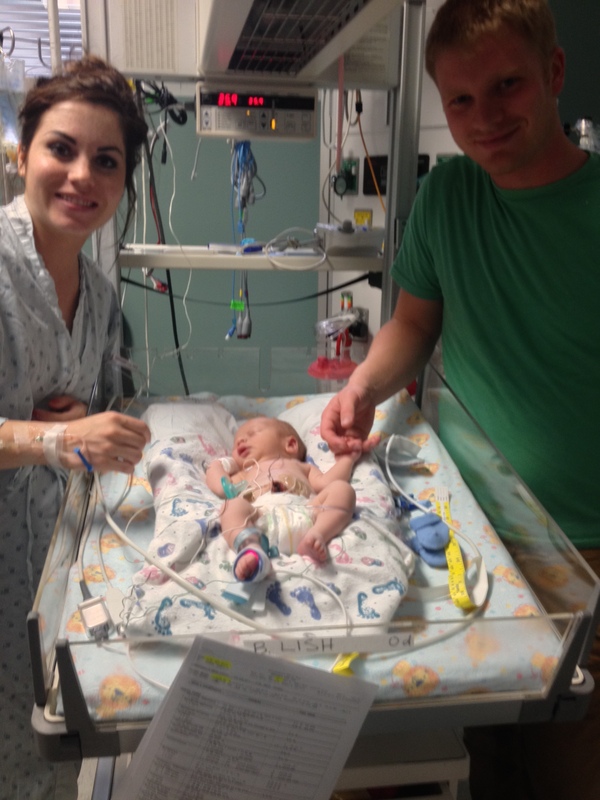 They also went out of their way to come see Finn and me after his 2nd open heart surgery. They are truly amazing friends that we will never forget. Finn is our Heart Warrior. 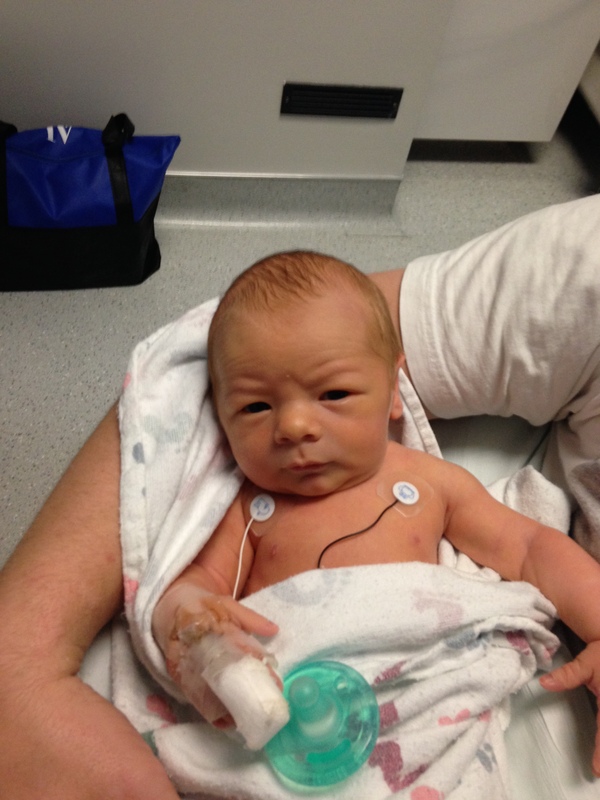 He was born with 2 heart defects. Transposition of the Great Arteries, which means his Aorta and Pulmonary arteries are switched. So basically his heart was on 2 different circuits instead of one like a normal heart. He also has a small left ventricle. He’s not a full hypo plastic but it’s not big enough to do what it is meant to do. We were not pre diagnosed so when Finn was born it was a complete shock to us. We were not prepared at all for what was coming our way. 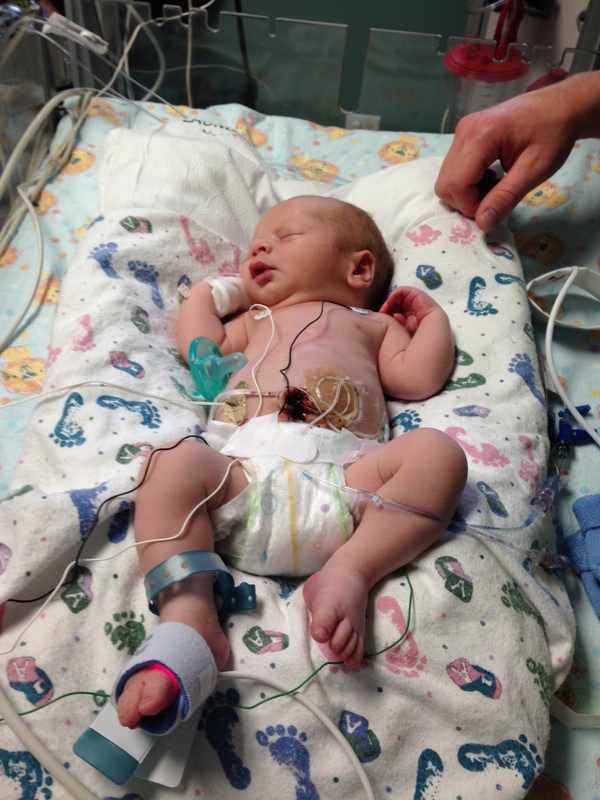 Finn was born by C- section at full term on October 15, 2013. 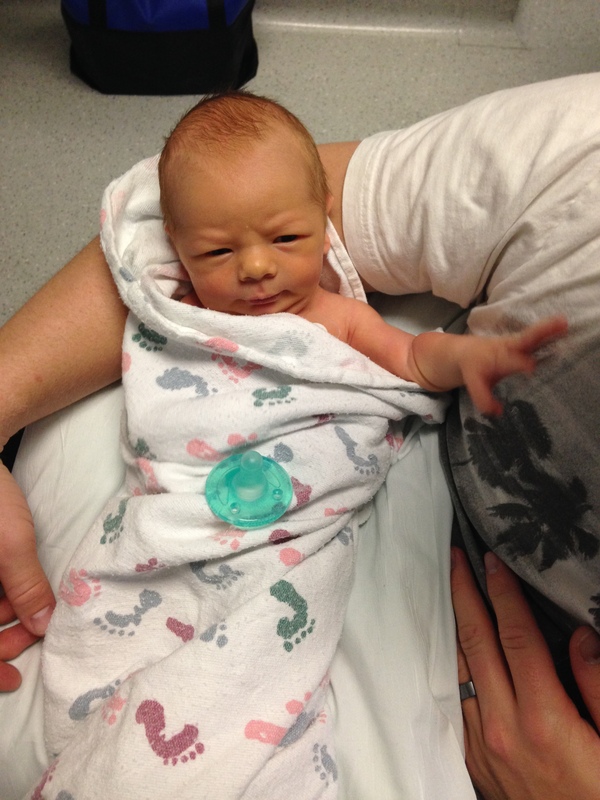 We had no indication anything was wrong with him until a few hours after he was born. The nurse decided to check oxygen saturations because his color was a little bit off. His sats were low and he was not responding to oxygen so they ended up needing to intubate him and life flight him to Primary Childrens Hospital. They told us more than likely there was something wrong with his heart and they would have more information for us in the morning. I was devastated. I felt helpless. I remember thinking none of this made any sense to me. All I could do was cry. I sat in my recovery room alone, while my husband Jared was at the hospital with Finn and my family was trying to take care of my other 2 boys, and I just cried. Once I was able to leave the hospital things got harder. Jared and I were juggling between being with Finn at the hospital in the CICU and trying to still take care of our two other sons at home, Cam, 6, and Jack, 3. We didn’t have many answers as far as treatment or surgery for Finn. The Drs rarely, if ever, see these two defects together so they had no idea how to proceed. 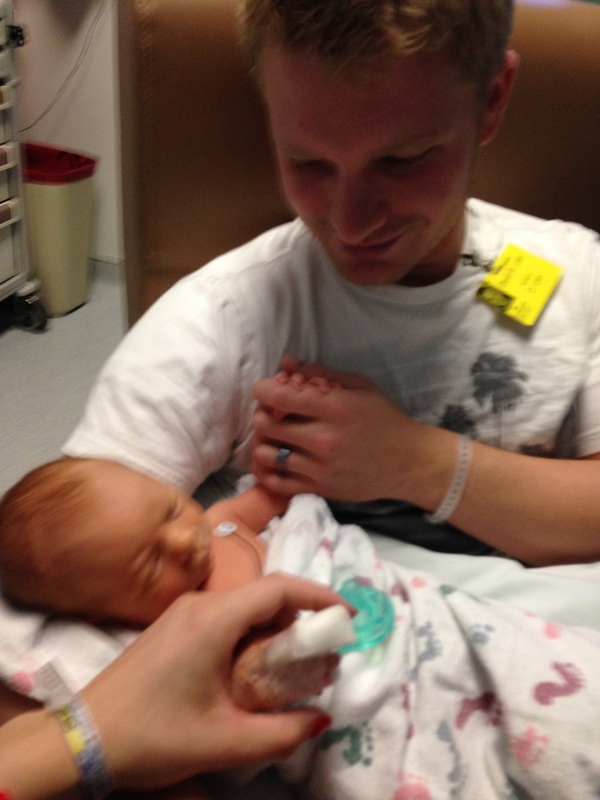 After a few days in the CICU they finally let me hold him for only the second time in his life. He looked perfect. I remember thinking he looked just fine and they just needed to let us go home! We had been bombarded with talk of surgeries, a chance he wouldn’t survive, how his life and ours was going to be different forever that I would outlive my son and eventually he would need a heart transplant. There were tons of medical terminology, Drs, tests, meds, x-rays, and echos. We were mentally and physically exhausted. I just wanted to take my baby home and be all together as a family! On a particularly hard day I was sitting in Finns room talking to one of his nurses about how hard this was and that I didn’t think I could do this. I will always remember what she told me. She said, “If you had the chance to have Finn with his heart problem or not at all, what would you choose?” Of course I would choose Finn, and everything that comes with him. 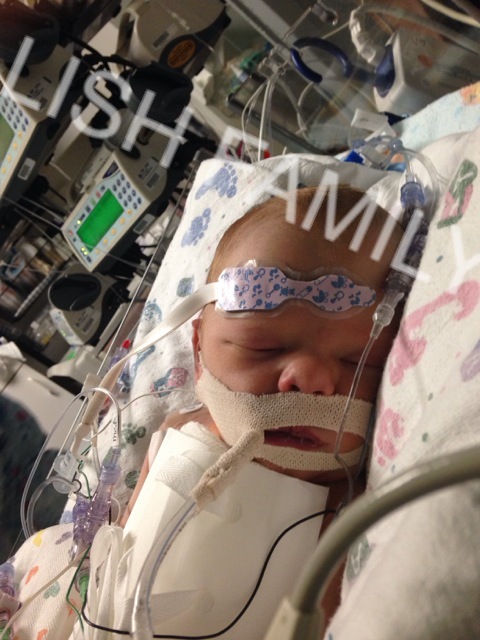 October 23rd was Finns first open heart surgery. He was 9 days old. We did a lot of praying up to this point and were able to give him a blessing. The Drs didn’t even really know exactly what they were doing until that morning. We wheeled him to surgery and then we were told to wait. Waiting for your son to come out of heart surgery is the worst! Surgery lasted just under 4 hrs. We were told everything went well. They put in a shunt to help his blood mix and a band around his Pulmonary artery to try to make the left ventricle grow. This was a temporary fix. It was hard to see him after surgery. 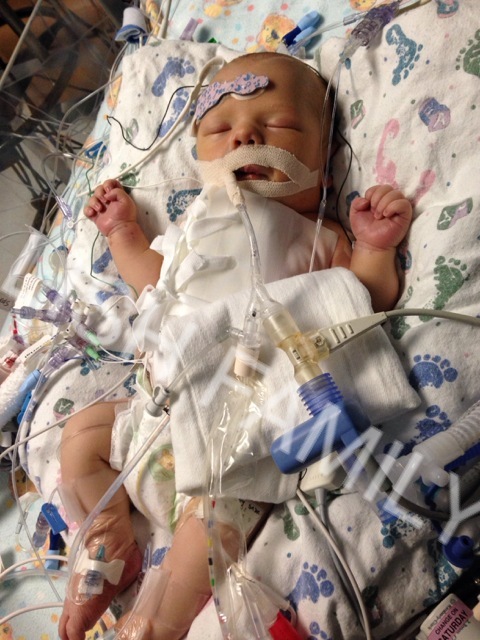 The amount of tubes, wires and machines that were there to keep him alive was overwhelming. But at least that part was behind us. I felt like I could breathe a tiny bit better. Two days after surgery I was at home with my boys while Jared was on his way to see Finn. I got a call from one of the CICU Drs. He told me that Finns blood iron levels had dropped significantly and they were going to do a scan to check for a brain bleed. 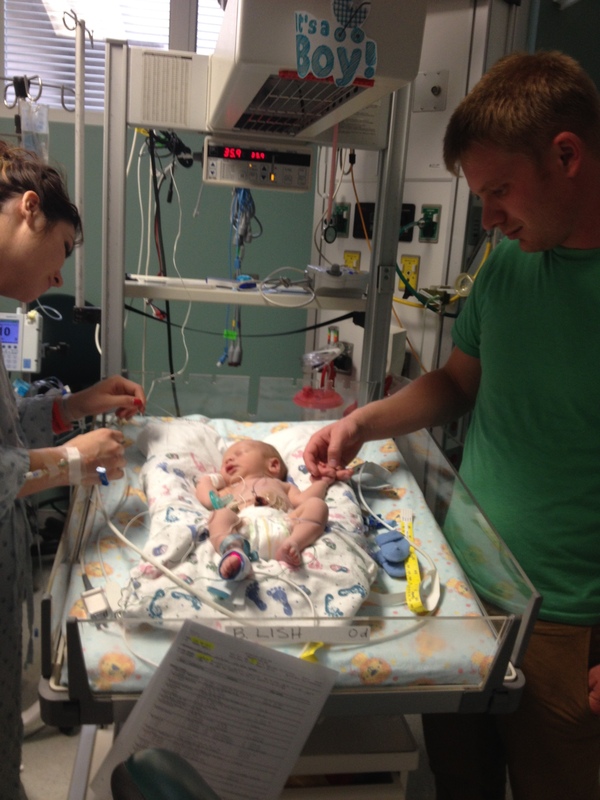 He was also struggling to breathe and they needed to give him a blood transfusion. I panicked. I dropped my boys off and rushed to meet Jared at the hospital. When we walked into the CICU I could see tons of people crowded around his room. The nurse was rushing around and all the Drs were trying to figure out what was going on. When I looked at him he looked so scary. He was purple and breathing so fast. You could tell he was struggling. The Drs said he was going downhill fast and they didn’t know why. They needed to re intubate him to help him breathe. They closed all the curtains and everyone was rushing around. They had to give him a medicine that paralyses them so they can intubate. I hate that drug. It was one of the hardest things I have ever seen. I had to walk out. I didn’t want to see my baby die. I honestly thought we were going to lose him. I stood in the hall and cried. All I could hear were machines beeping faster than they should and people talking fast and moving around. What would I do if we lost him? How would I tell his brothers what happened? I wasn’t strong enough for this. Once they got him stable I went back into his room. He looked a little better and slowly continued to improve. We were relieved! Eventually they told us he had culture negative sepsis. Um, kinda scary! Finn made progress here and there but it was slow. Finn dealt with stomach issues and throwing up a lot. 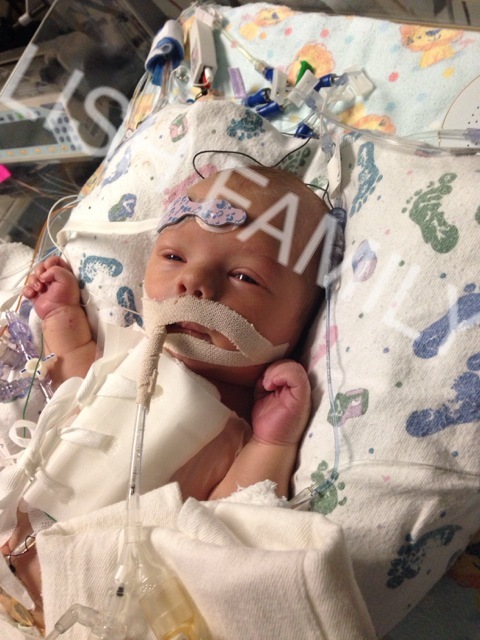 At one point he had two tubes in each tiny nostril, two for his stomach issues and a nose cannula for his oxygen. He ended up getting an intestinal infection that kept us there for an extra 2 ½ weeks. Jared and I were trying to hold it together for the older boys and tried to do some fun things with them when we could so they didn’t feel forgotten. We took 24 hr shifts at the hospital with Finn and saw each other a total of maybe 10-30 mins a day the last 2 ½ weeks we were at the hospital. It was hard. I remember I had all sorts of emotions during this time. I was angry, sad, scared, hopeful, and then all the emotions would start over again. Life would never be the same and that was devastating to me. We were finally able to bring Finn home a few days before Thanksgiving! We had a lot to be grateful for that year. 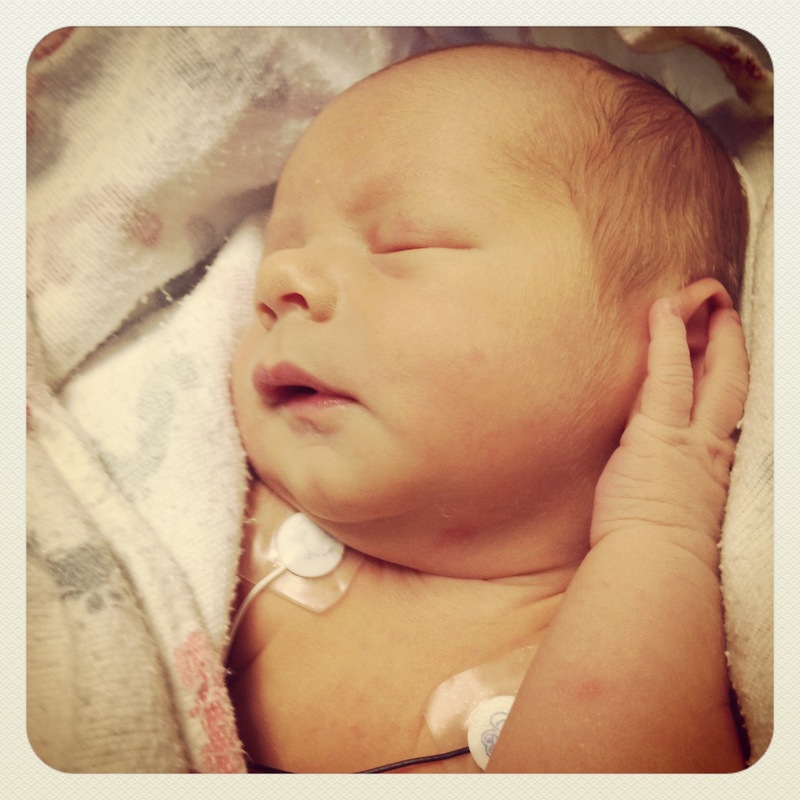 Despite the extra machines and the feeding tube we brought home with us, we still had our beautiful baby Finn. And that’s all I wanted at that moment. He was such a good baby all the time! No exaggeration. He was always so happy and content and we considered that a huge blessing. We were in and out of the hospital a few times before his next major surgery. Trying new meds to help his heart pump more efficiently, the cath lab to fix a kink in his shunt, on and off oxygen, checking sats all the time. We were in such an unstable place and I was nervous and uneasy about him almost all the time. I was trying to enjoy him and our new “normal” but I always had the next surgery looming in the back of my head. We had good days and bad days. Days where I was really hopeful and I thought I could do this and days where I was angry and questioned why this happened to my family and if I was strong enough to do this. I had to keep telling myself I could do hard things and that everything was as it should be. Everything would work out how it was supposed to and we would be ok, no matter what the outcome would be. 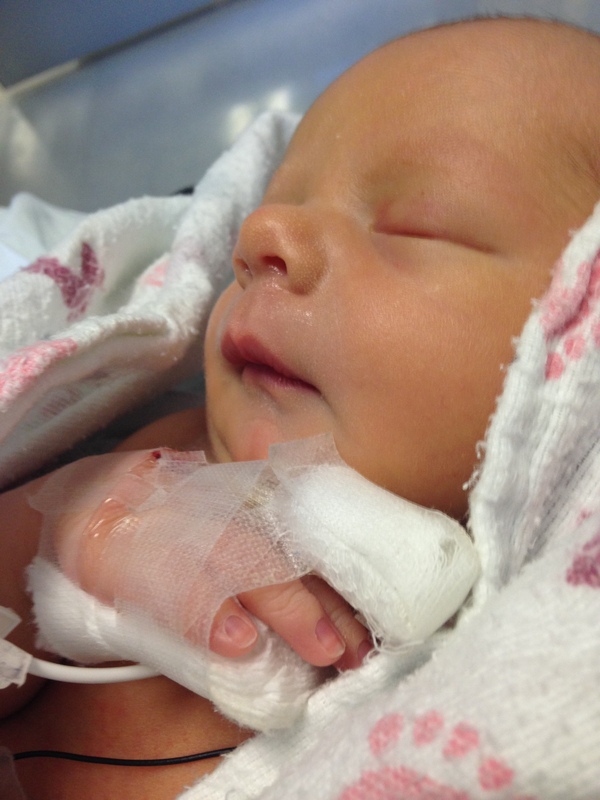 Because of Finns two defects, there were two very different surgeries we had to think about with two very different outcomes. There was one that was a way better option with a way better prognosis. 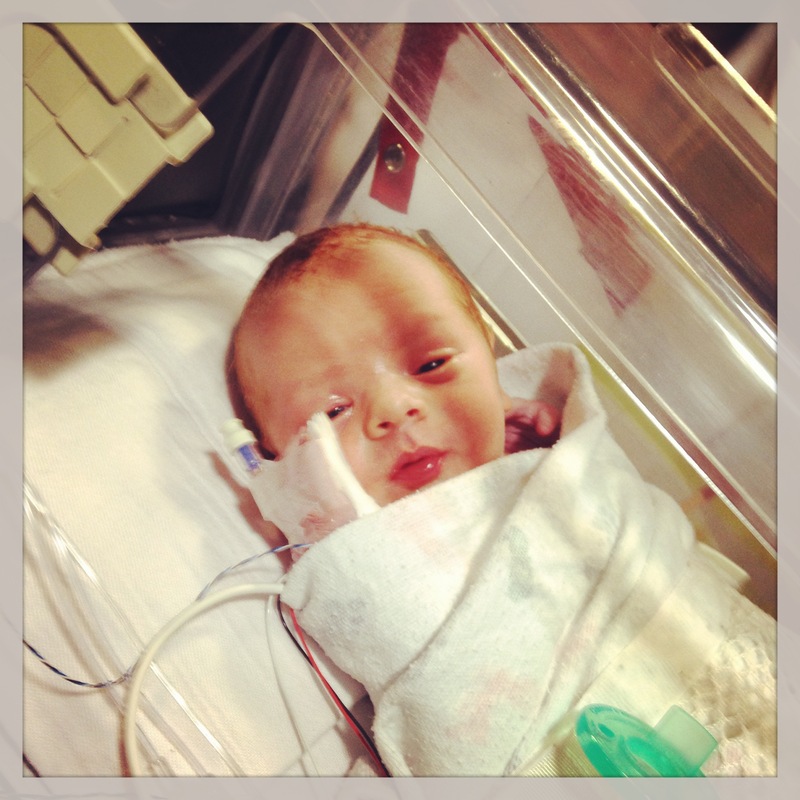 We prayed every day that we would receive a miracle and Finn would be able to have the “better” surgery. We learned that our Heavenly Father’s plan for us and for Finn is far greater than what we think is best. He would have to have the other, not so great surgery. I was devastated. But soon learned that maybe this was the “better” surgery and I just couldn’t see that before. 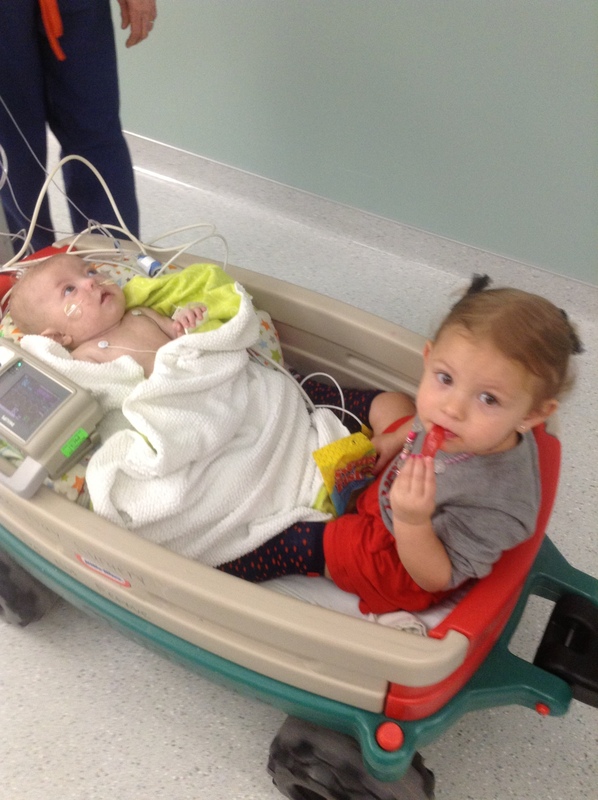 We finally had a date for Finns 2nd open heart surgery. This would be the big one. The one that would hopefully put us in a more stable place and give us decades before another surgery was necessary. May 1st, 2014. In a way I looked forward to that day because that meant it would be behind us. We got up early that day and went to the hospital. Got all checked in and was ready to go. I remember I wasn’t nervous like I thought I would be. I was abnormally calm. That was a blessing. We walked down the dreaded hall to surgery. Once we got to the double doors we kissed him goodbye, wished him luck and handed him over. We watched as the Anesthesiologist walked down the hall with our baby, Finn watching us as they walked away and then the doors closed. My heart felt broken. Jared and I cried and held on to each other tight as we walked to the waiting room to take our seat and wait. We were able to get updates every couple hrs. I swear it felt like we were there forever. Finally, 8+ hours later he was done and alive! The surgeon came in and said everything went well. We could see him soon! Finally when we were able to go see him we walked into his room in the CICU and the first thing we noticed was not the tubes and wires and IV’s, it was his color! Finn was PINK! He was finally the right color. After surgery Jared and I took 24 hour shifts like last time but it seemed much easier this time. Finn was doing remarkably well! 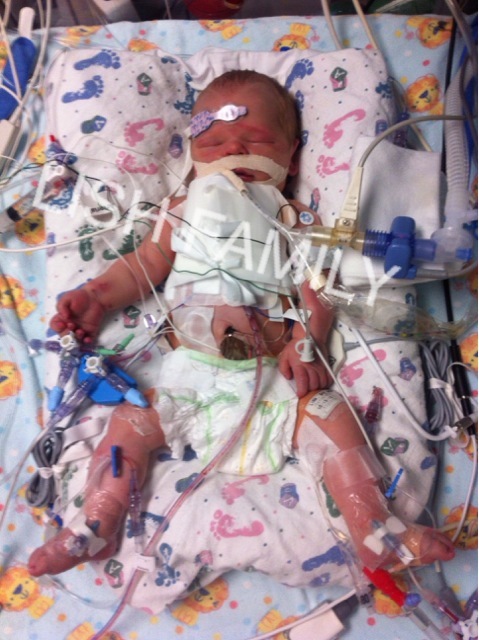 We were told we would probably be in the CICU for 3 or so days and he was out in less than 2! The Drs were amazed at how well he was doing! After a few days, he was smiling again, and wanting to play. We had a long recovery road ahead of us but he was off to a great start. The Drs walked in for rounds one morning and one of them looked at us and said, “Whatever you did worked. He’s doing amazing.” We did a lot of praying, a lot of fasting and had a lot of family and friends and people we didn’t even know supporting us. We have received many miracles. We were supposed to be in the hospital for 2 -3 weeks and were released after only 6 days! Recovery at home was hard and long but for the most part Finn did well. We are now almost 3 months post op and doing fantastic! Finn is thriving and growing and you would never know by looking at him that he has ever had a problem. He has defied the odds and amazed the Drs. 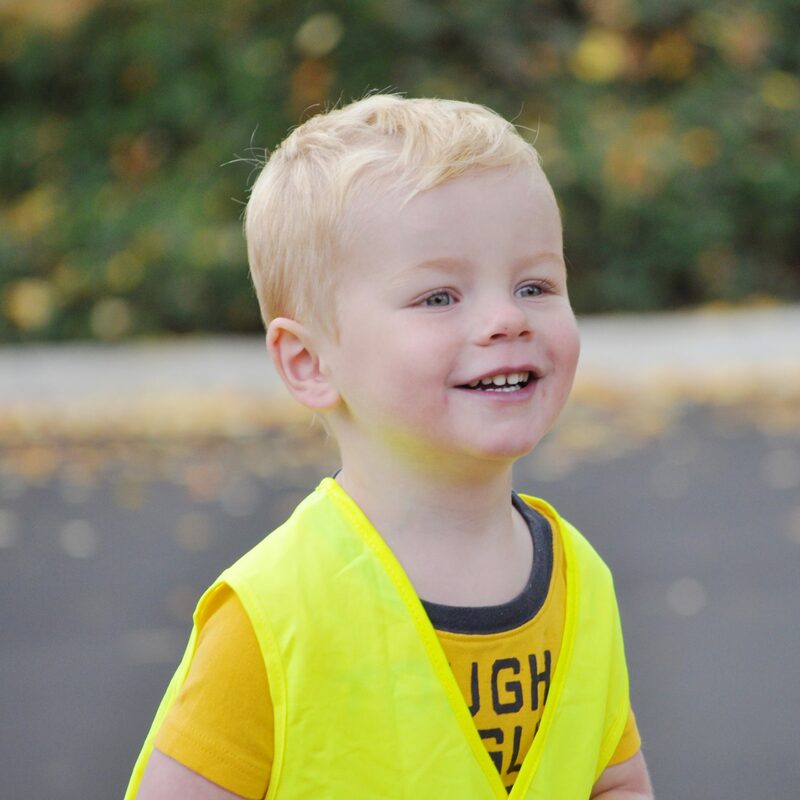 Our heart journey is not over and Finn will always have to be monitored by his cardiologist but the hope is that his heart will be able to function this way for decades before a heart transplant is necessary. 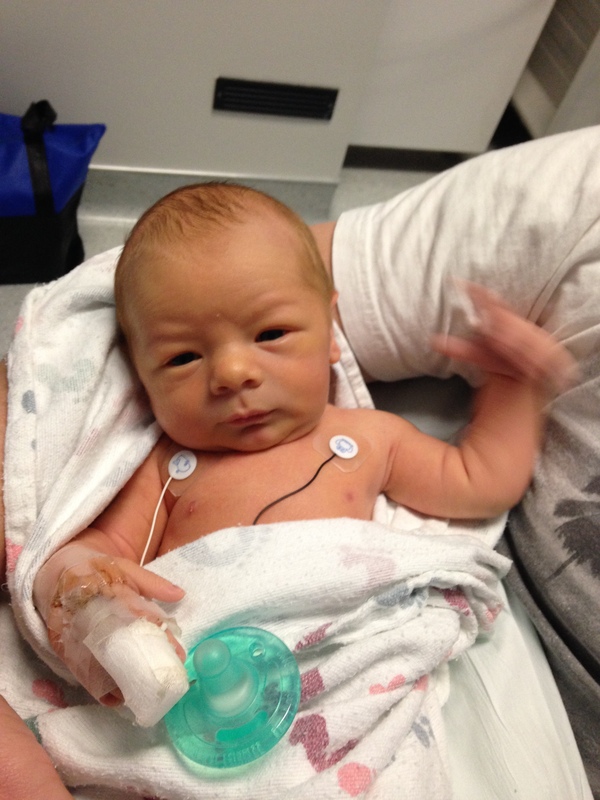 Finn is a fiercely determined little boy and we know he will do amazing things. We are enjoying every minute we have with our sweet baby Finn because you never know when things will change. We feel truly blessed beyond measure to have him in our family. He has taught us to have faith. And he has taught us that we can do hard things. **The pictures in this post are very personal and I only share them with family and close friends. I put a watermark on each picture in this post. I do not want Ollie to fall victim to any fake Facebook profiles or “click like to save this child” posts that float around the internet. David and I bought this picture a few months before Oliver was born. It is by Simon Dewey and is titled “In His Constant Care” It hangs in Ollie’s nursery. My head hurt so bad I had to lie down. I was so nervous and jittery. I tried everything I could think of to distract myself. I played on my phone, read comments from friends, and sent text messages to my family that wasn’t there. We were told that the surgical team would call us periodically with updates. The room we were in had multiple families waiting for their children just like we were. There were two people up front and they would answer the calls and ask for a representative from the family to come up to the front for their phone call. Before we got our first phone call our surgeon came walking in to the room. My heart sank. I thought Oliver must have died and he was coming to give us the bad news. Luckily Oliver was fine and our surgeon was coming to tell us that it had taken longer than usual to get started because they had a hard time getting an arterial line in Ollie. He had been the one to finally place it and they would be getting started shortly. I felt better at this point and decided I would visit one of the hospital pumping rooms. David came with me. We went down to the CICU to use the room down there and I remember it feeling empty since I knew Ollie wasn’t in there. I labeled and dated my milk and gave it to a nurse and then headed back upstairs. David forced me to eat a breakfast sandwich and managed to get a few bites down my throat. I tried sitting in a chair and couldn’t take the pain of my headache so I lied down on the ground. I was so anxious to get our phone call letting us know how everything was going. The phone rang and I had a feeling it would be for us. Sure enough the receptionist asked for the parents of Boy Lish. Despite my headache I bolted up from the floor and David and I hurried to the front. I refused to touch the phone because I didn’t want to be the one to receive any bad news (selfish I know) so David did the honors each time. He had an unemotional look on his face and I thought there must be bad news. When he hung up I looked at him expectantly and he told me that Ollie was on bypass and everything was going good. We walked back to our seats and our parents looked anxious to know what news we had just gotten. We relayed the good news and resumed our positions. Me on the floor and David in a chair “studying” for school. I told David that he needed to smile if it was good news the next time we got a phone call so I didn’t pass out with fear. The next phone call was a report that Ollie was doing well and the surgery was officially underway. David smiled so I would know it was good news and I gave our parents a thumbs up. We walked back to our seats and tried to keep ourselves as occupied as possible. My mom had started a group text with my family that morning and we would give them updates as we got them. My family said that they were very uptight. My sister Cassie said she text my mom at least 101 times. All were praying for us and very anxious to hear how it was going. I received many texts and messages on Facebook wishing us well and letting us know they were praying for us. I felt each and every prayer. They were tangible. I felt comfort and peace and strength that I knew wasn’t my own. It was truly one of the most spiritual days of my life. Our last phone call reported that Oliver’s surgery was over and they were just finishing the echo to make sure his heart was functioning how they wanted. We were told our surgeon would be out to see us within an hour. A few hours later we still hadn’t seen our surgeon and were starting to get nervous. He finally walked in and he knelt down on the ground by me where I was laying and told us how the surgery went. Everything went really well. The only obstacle they had was getting his bleeding to stop at the end. The reason it took so long was because he wouldn’t stop bleeding so they had to take their time packing the area and cleaning it up. He told us we would get a call again as soon as we could see him. It was at this very moment that I grew a love for this complete stranger. This man had spent a good majority of his life in school learning how to operate on a heart the size of a walnut. He had just stood for 8 hours straight fixing my sons heart. I can’t imagine the exhaustion he must feel after work. He left us and we continued our waiting game. There was a certain sense of relief now. We knew that he survived up to this point. The odds were looking pretty good! We finally got our phone call and we rushed down to the CICU. I could not have prepared myself for the sight I saw when we walked into his pod in the CICU. There was a tube or IV coming out of every orifice. His chest would be left open for a few days so it was covered with a white plate of sorts. He was asleep. We walked up to his side and touched his hands and feet. We talked to him and told him how proud we were of him. He opened his eyes a little bit and it killed me when he did. I couldn’t stand the thought of him being in pain. We sat with him for a few hours and then went back to our hotel room. Our parents stayed with him. When David and I got back to our hotel room we fell to our knees and said a prayer. We thanked our Father in Heaven for sparing Ollie’s life and helping us all through this long day. We packed up our belongings and headed back to the hospital. We were lucky enough to get a sleep room that was on the same floor as Oliver. 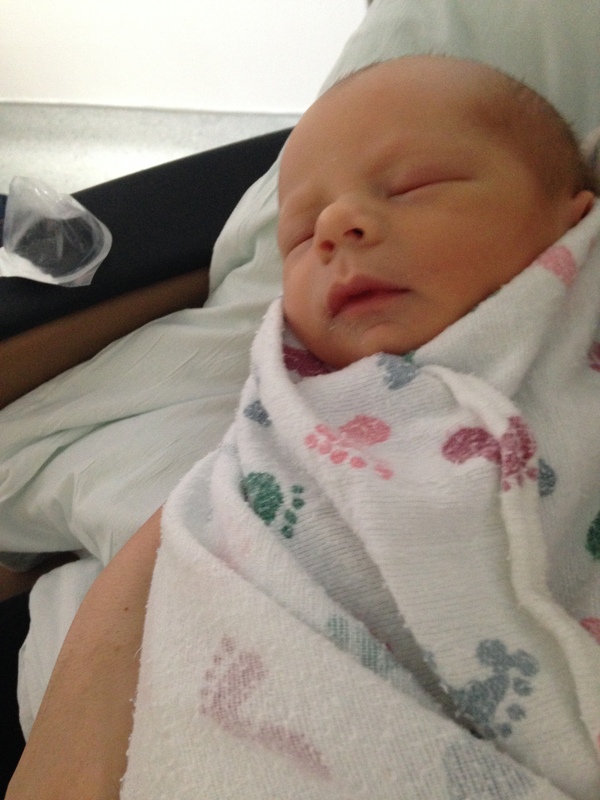 We sat with him for a few more hours and got to know his nurses a little better. When we reached exhaustion we said a hard goodbye to Ollie and went to our sleep room. Again we said a prayer of thanks and crawled in our twin bed and fell asleep. I was pumping every few hours so we got to see Ollie in the middle of the night. 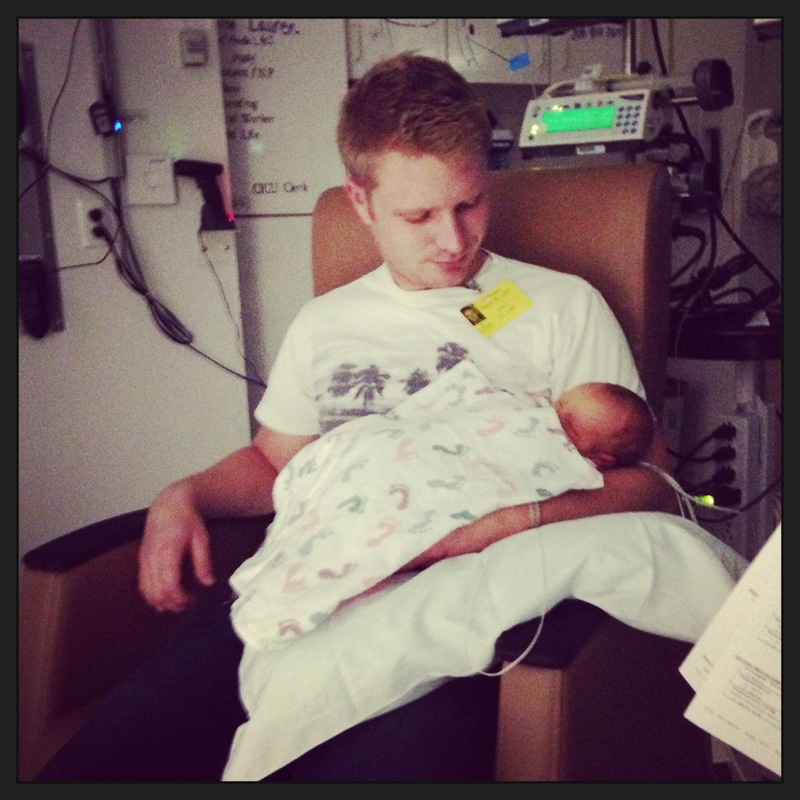 David sat with him while I pumped…then we reluctantly went back to our sleep room. It was comforting to see him every few hours and also knowing we were so close in case something went wrong. You live in constant paranoia for quite a while after surgery. I want to stress the power of prayer. It is real. God is real. He loves us and is mindful of each of us. He wants to help us. He will help you through the trials of this life. Do not abandon him in your time of need. This illustration of the Savior gives me comfort. David and I took turns holding Ollie for a few hours and then Ollie and I said goodbye to David. He had to head back to school for a few days. At this point we didn’t know what surgery Ollie would be having. 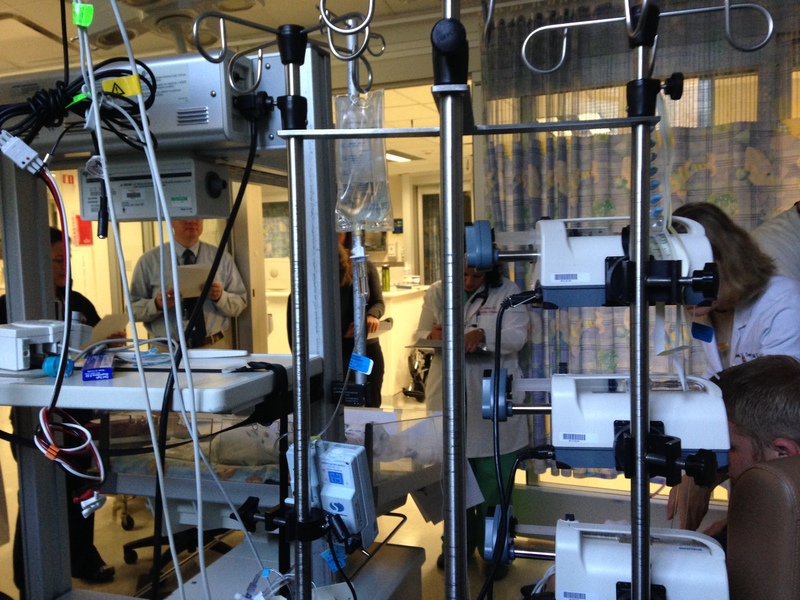 We were still praying that it would be the simple procedure done in the cath lab. Doctors came in and out looking at his echoes and labs. I was still fighting a horrible headache, but by strength from my Father in Heaven I was able to push through it. During the rounds that day a team of 7 or 8 people came into Ollie’s room. 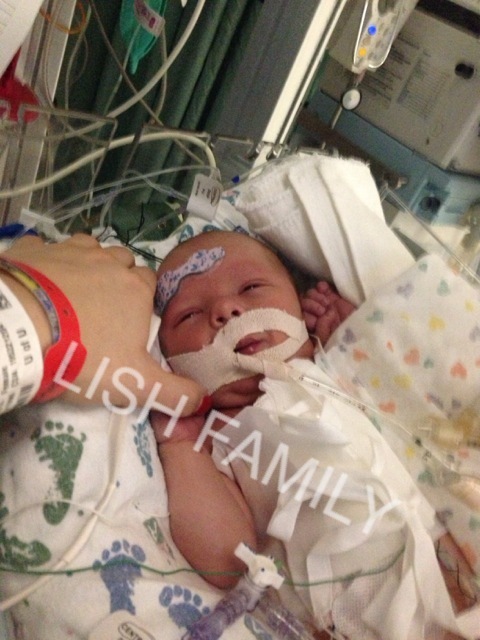 They started talking about “baby Lish” and his condition. They discussed the condition his heart was in and how he was doing as a whole. 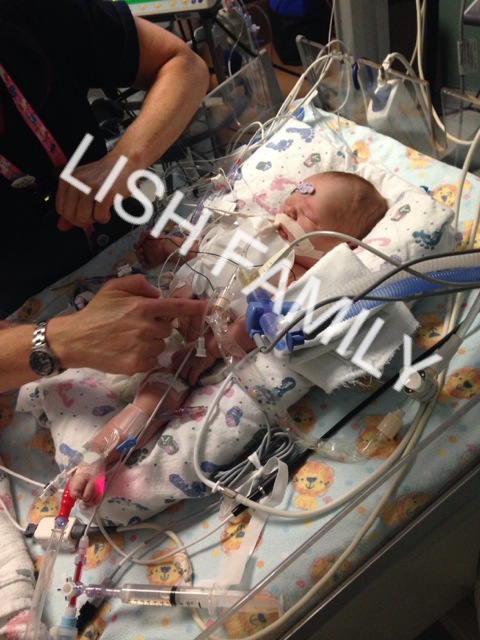 They kept referring to his condition as Hypoplastic Left Heart Syndrome and up to this point we thought it was Aortic Stenosis that could possibly lead to Hypoplastic Left Heart Syndrome. Hearing them say he had HLHS sounded like a swear word. 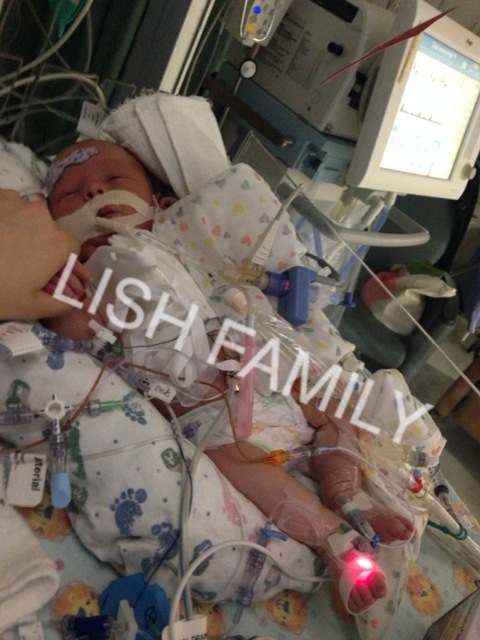 They said he would be having his first open heart surgery on Wednesday morning. I had to turn away from them. I silently cried and sent a text message to my family telling them that he did have HLHS and he would be having his first OHS on Wednesday, October 16. 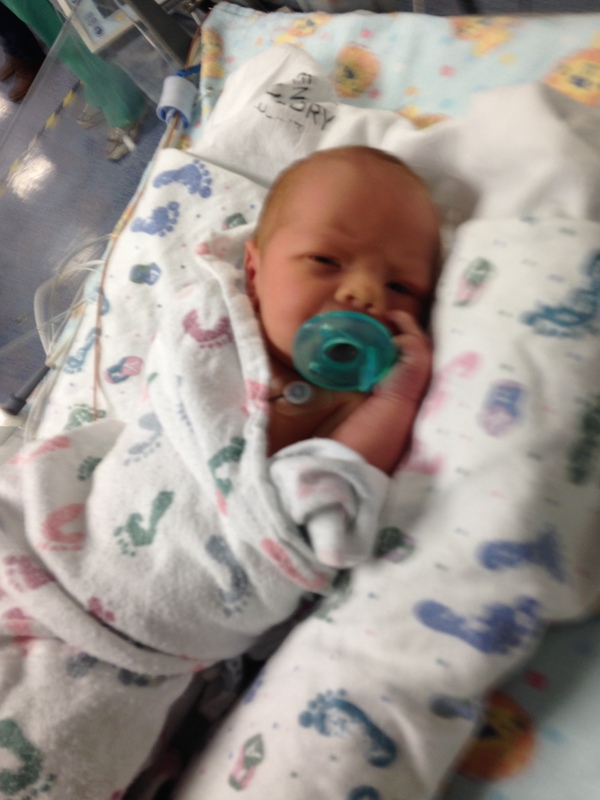 He would be 3 days old the day of his surgery…and it just so happened to be my 23rd birthday. The thought crossed my mind that he may die and my birthday would become the worst day of my life. After the team of doctors left I held him for a few more hours. I got to “practice” breast-feeding him. They call it non nutritive breast-feeding since my milk hadn’t yet come in. At this point he wasn’t allowed to have any food. He was getting nutrients intravenously. I took so many pictures as I held him. It was a peaceful day. I knew we still had 2 days till he was to have his surgery. My heart mom friends told me to take pictures of his chest without the zipper scar. I kept looking at his perfect chest and couldn’t imagine him with a scar. 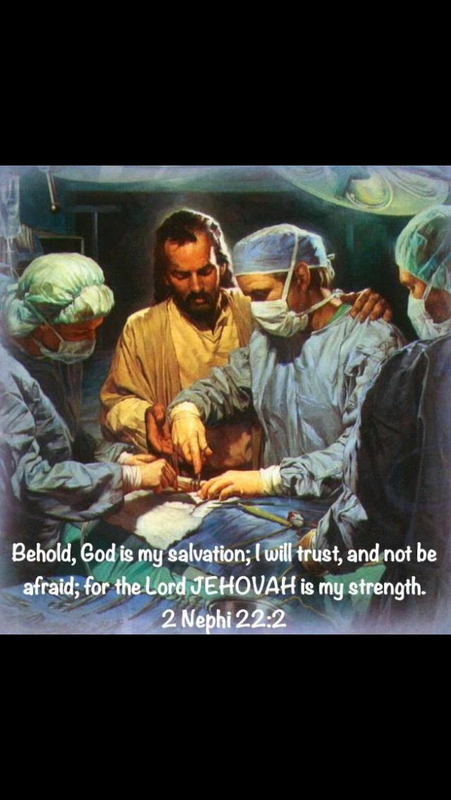 At the time I did not let myself think about what they would be doing to him during surgery. I didn’t allow my brain to think about ANY of it. I knew I couldn’t handle it. Looking back on the situation I know that I was protected from any of those thoughts. I can now handle thinking about bits and pieces of it. 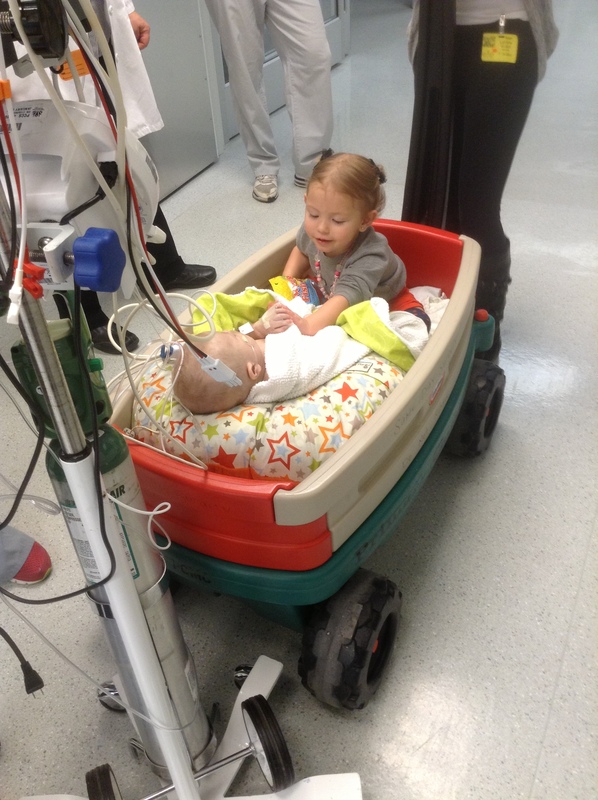 The two days before surgery were spent holding Ollie and watching the “goings on” in the CICU. Each child in there had their own nurse. I started to recognize the faces of other parents as we were all coming and going. A few would even go on to be my friends and I didn’t even know it! 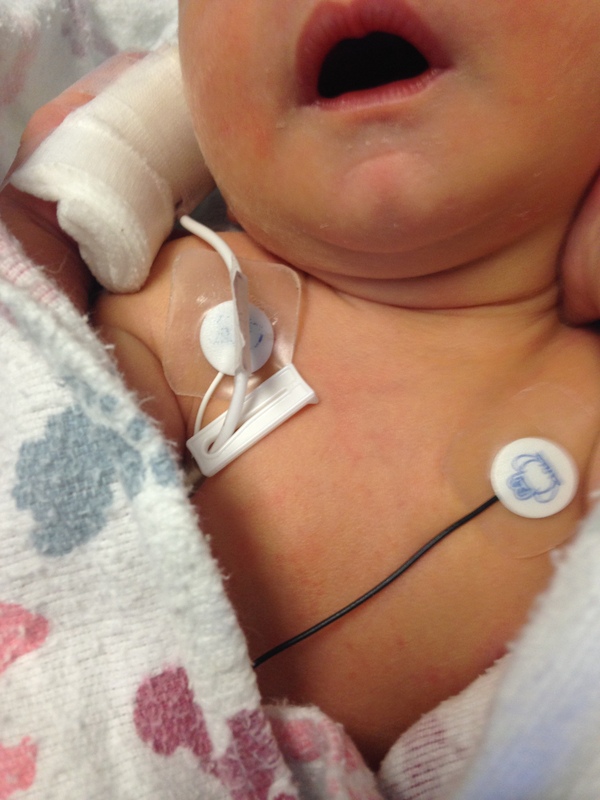 Each child had multiple IV’s, tubes, and gadgets. The beeping of the monitors was enough to make anyone go mad. 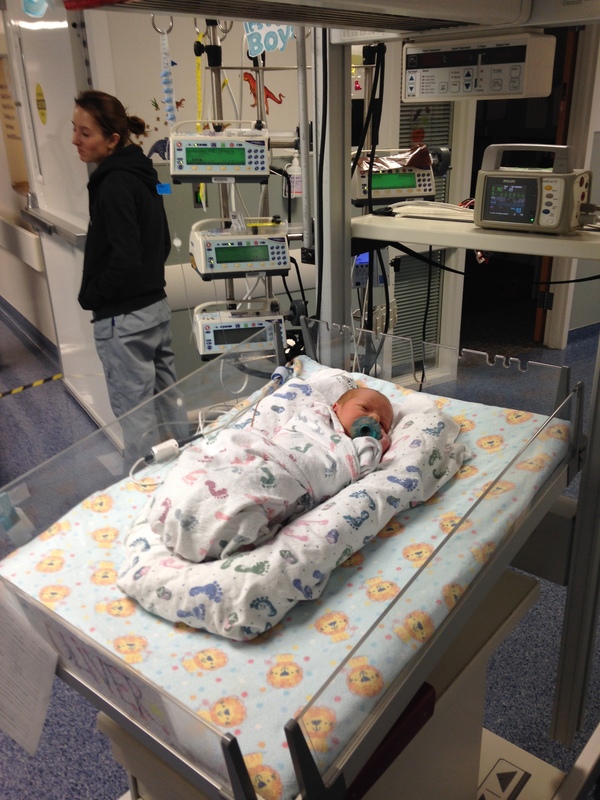 I spent my time asking questions and getting to know each of Ollie’s nurses. At night we slept at the University Guesthouse Inn. It felt like a Taj Mahal. Sitting in the hospital was uncomfortable and exhausting. I hated leaving Oliver at night because I didn’t want him to be alone. I felt very guilty and couldn’t wait to get back to him after being gone all night. On Tuesday afternoon I couldn’t handle the headache anymore. I went back to my hotel room to sleep. I was getting anxious for the big day. I was awakened from my nap to my phone ringing. It was an 801 number and I was scared something was wrong with Ollie. I answered it and a man on the other line asked if I was Mrs. Lish and told me he was my sons surgeon and he was hoping to talk to us before surgery the next morning. I told him my husband would be in town any minute and we would head right over. As soon as David got there we hurried to hospital. We were extremely anxious to meet the man who would hold our sons life in his hands. He was a tall man. Young. In his 30’s. He was kind, you could tell instantly. He drew a picture of Oliver’s heart on the chalk board and then erased it and drew what it would look like when he was finished. He told us of all of the risks that come from a surgery like this. Some were: risk of stroke, slight chance of acquiring a disease from the blood transfusion, dangers of being on bypass for an extended period of time, risk of changing his cry and losing the ability to swallow….these are just a few of the things he mentioned. I zoned out for some of what he said and just sat there and cried. Luckily David is fascinated by medicine and was able to hear and comprehend what our surgeon had said. We finished with him and spent a few more hours holding Ollie and taking pictures of him. Davids family came to the hospital to also spend some time with us. I left to get some dinner with my parents. I was feeling very overwhelmed at this point and broke down when I got in the back of my parents car. I was sobbing and I told them that I couldn’t do this. I told them I wasn’t strong enough to handle this. As soon as the words came out of my mouth I knew they weren’t true. I knew I could handle it and I would. I had no other choice. After pushing some food around on my plate I headed back to the hospital to spend more time with Ollie. It was very hard to leave him that night. We knew it was important to get plenty of rest but still couldn’t shake the horrible feeling of leaving him. We didn’t sleep much that night. The next morning we were both up bright and early. We wanted to spend some quiet time with Ollie before he was taken back for surgery. We took so many pictures that morning and shed a few tears. We didn’t talk much. Our parents came in and our dads and David gave Ollie a priesthood blessing. After the blessing they left us and we said our goodbyes to Ollie. This little infant at 3 days old held both my hand and Davids and let us know that he was prepared and ready for the challenges ahead. I knew that is what he was telling us by the look in his eyes. They were bright and clear. He comforted us that day. I know he knew we needed that message. Our nurse came in and told us we could walk with Ollie to the surgical unit. Once we reached our destination she told us we could kiss him goodbye. I kept telling him that he could do this and he was so strong. We kissed him and took some pictures and then walked out. Thus far in my life this has been the hardest thing I have ever done. At this point I broke down and David and I stopped walking and held each other for a moment. He told me it would be okay. We walked to the surgical waiting room and met our parents there. The waiting game had begun. My girls and I met Sadie in Logan to spend the day with her, keep her company, and try to keep her mind off the delivery that would soon happen. We met with our aunt and cousin and the conversation was positive and hopeful of the outcome. When would Ollie come? How severe would his situation be? Would Sadie and David get time with him? How soon would surgery be? Word came to the waiting room that it was time to push. Not long after, we got the news that he was here!!! Pictures and ohhhs and ahhhs were exchanged. After some time, family was allowed in the room. I was so proud of Sadie and at the same time angry. This moment between her and David and their new baby was robbed. By the time we were able to see them, Oliver had already been taken to be prepped for the surgeries that would soon happen. We talked about how the labor and delivery has been and made small talk, but the uncertainty of the situation hung in the air. We were told that they would be given a few moments with Oliver before he was transported to Primary Children’s. When I met Ollie for the first time, I knew that he was special. He had bright eyes and perfect pinkish skin. I could not believe that his heart had anything wrong with it– he looked too healthy. The men in the room were able to bless Oliver’s little body at that time and a great deal of comfort followed. The future was still uncertain but one truth that was evident was that this little boy was ready to fight. The last moment before transport was unreal. 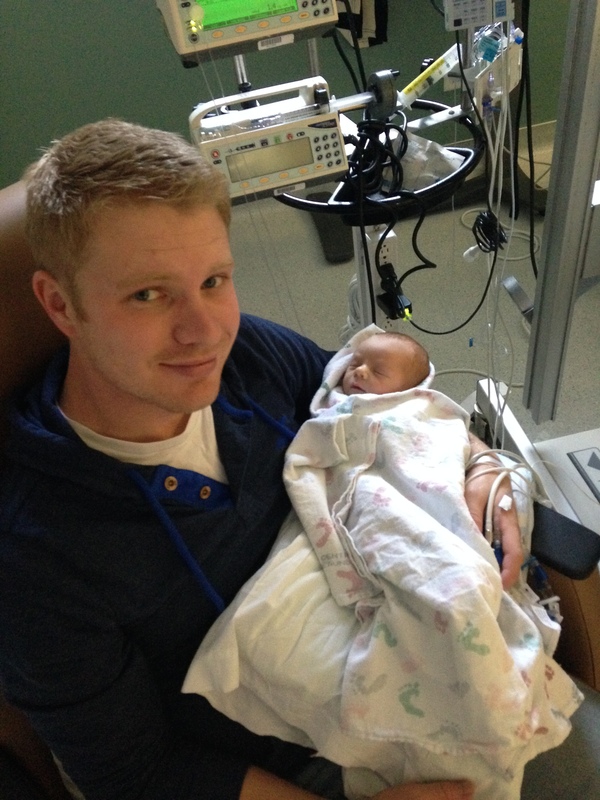 Sadie and David stood around their baby boy and he looked at them right in the face–alert and aware– and let them know that he was ready to go into battle, he was ready for the fight of his life. There I stood totally helpless but in that same blessing, I understood that Oliver was given to these parents because they had been blessed with the things they would need to endure the coming months together. David and I were packed and headed to the hospital. Davids dad had given him a blessing and then David and his dad gave me a blessing. I was so nervous. I had been waiting for this moment for 9 months, but still didn’t feel prepared. We checked in and got settled into our hospital room. I had heard about this specific room many times the past few months. 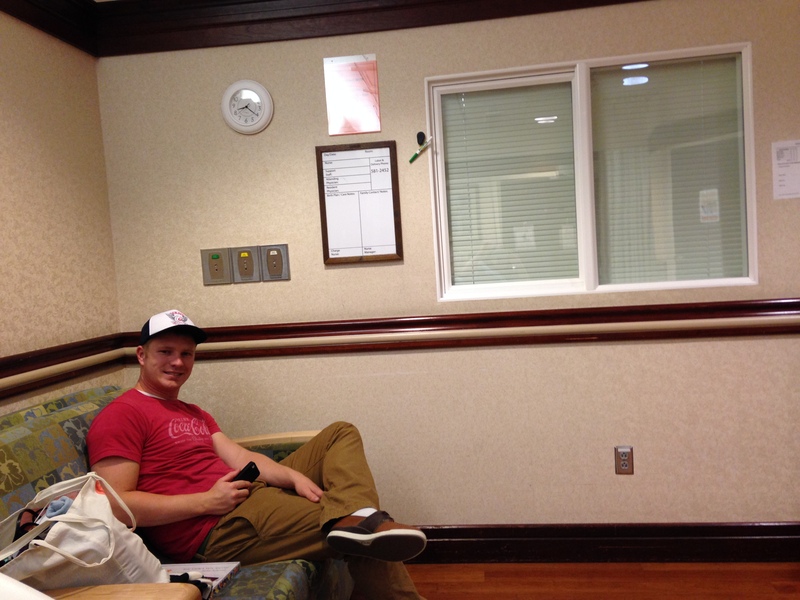 This room had a little window like a drive thru that they would pass our baby through as soon as he came out. 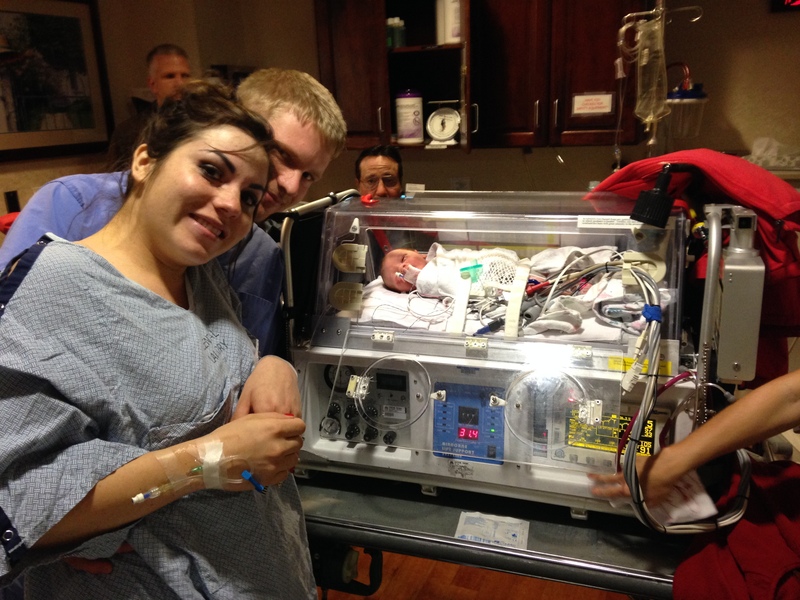 The little window led to the NICU. 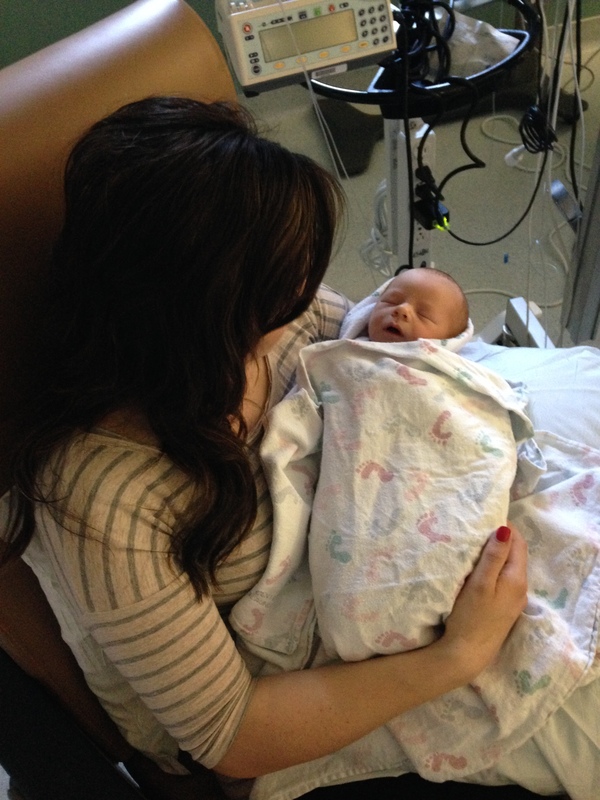 My nurse talked to me about my birth plan and many of my fears were put at ease. She was so respectful of my wishes and hopes for this labor and delivery. I changed into my hospital gown and was given an IV. 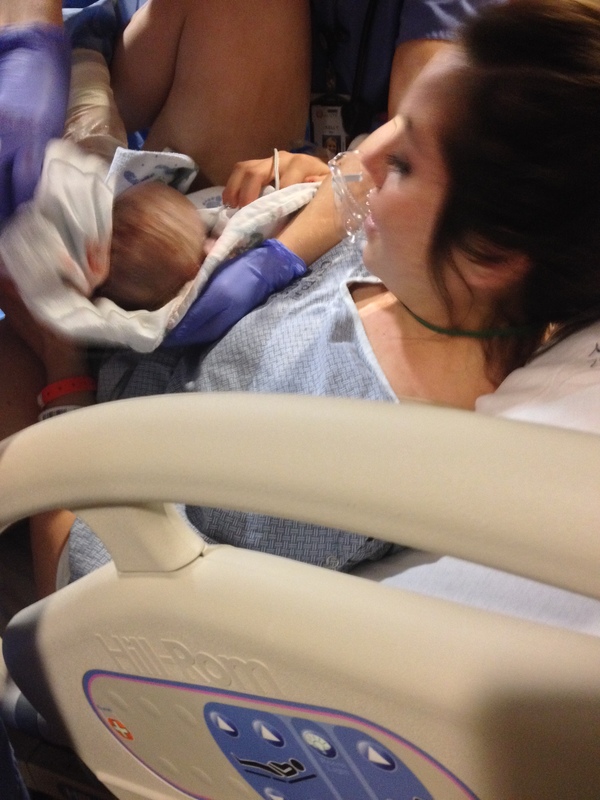 I was also hooked up to a machine that monitored my contractions and the babies heart beat. My wishes were to labor as long as I could without any pain medication, so the devices I was hooked up to were mobile and I was allowed to move freely. Since this was a scheduled induction they used Cytotec to start contractions. The contractions started out fairly mild and gradually started to build. I would get this first round of medicine and then in 4 hours I would get my second round. David fell asleep and I stayed on the hospital bed for a few hours willing myself to fall asleep. That never happened. I was not prepared for the contractions that were headed my way. They were nothing like the contractions I learned about in my birth class. I continued to push through and was given my second dose of Cytotec. An hour later I could not handle the pain anymore on my own. I told David to wake up. A few minutes later I thought I wet my pants. Much to my surprise my water had broken all on its own! I was excited until I had my next contraction….it was so intense I thought I would die.The contractions were right on top of each other. I barely had any time to orient myself before another would start again. The pattern was unnatural and not what I was prepared for. My nurse suggested I get in the shower. I stayed in there for an hour. David kept the water on my back and talked me through each contraction. 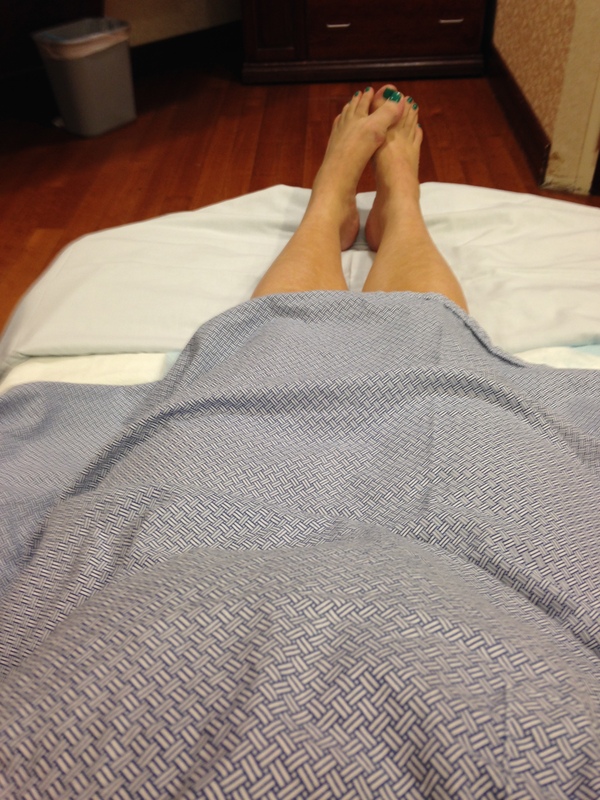 The pain was so intense, and the contractions were so close together that I knew I must be in transition. I asked my nurse to check my progress and I was only at a 5!!!!! I was completely devastated. At this point I had been laboring for 10 hours and I could not bear it any longer. I asked for the epidural. It took about 30 minutes till I got it. I had 2 contractions while getting it and was given strict instructions to not move. I thought I was screaming but David said I wasn’t (I still think I was and he doesn’t want me to be embarrassed). Right after my epidural my nurse noticed I was bleeding and checked me. I was now dilated to a 9! I finally had pain relief and was able to take a nap. I slept for a few hours and then started pushing. I only had to push for 15 minutes until he was out. The doctor held him up close to me. 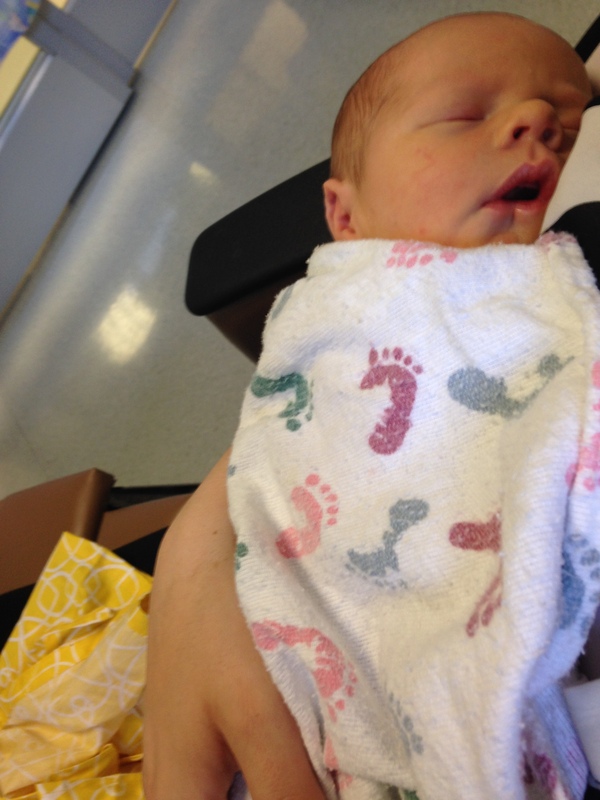 My nurse told me I could kiss him so I did….and that was it. He was gone. The next hour was spent stitching me up. At one point some one brought in a sticky note and told me what he weighed and how long he was. 6 pounds, 9 ounces and 21 3/4 inches long. It didn’t feel like I had just had a baby. The doctor was joking with me that most women don’t even know they are getting stitched up because they are too busy holding their baby. Unfortunately I KNEW I was getting stitched up. I stared at the clock the whole time. My epidural only worked on half my body, so I was counting down the minutes until they were done and I could see my baby. After a few hours there was word that our baby would be in our room shortly. 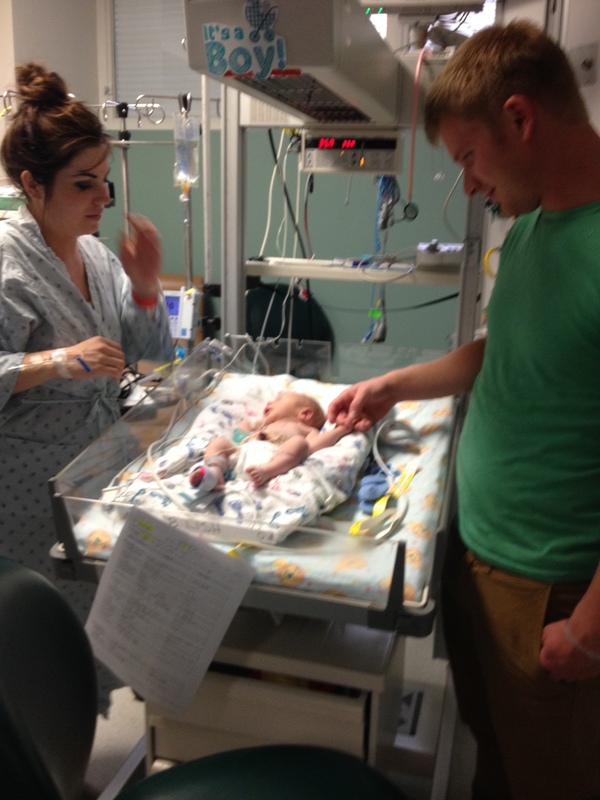 Each one of my siblings, and both my parents and Davids parents came into the delivery room. I held back my tears as they all came in. I was so humbled that they cared so much about us to be there. I didn’t notice it at the time, but there was a special feeling in the room. They finally wheeled Ollie in. There were 3 people from the Life Flight team that brought him in. He was in an incubator. I shakily stood and walked over to him. He was so beautiful. He had the fullest, prettiest lips. He was wide awake. Each one of my siblings and our parents were able to peek at him. No one spoke these words….but I know that in the back of all of our minds we thought this might be the only time we would get to see him alive. The men in the room were able to give him a blessing before he was taken over to Primary Children’s. David was able to walk over there with Ollie. He had strict instructions from me to be by his side the whole time. I wanted David to touch him and talk to him so he knew he wasn’t in this alone. I was moved to a different room and rested there for a few hours before I went over to see him. I felt like a horrible mother. All I wanted to do was hold him and look at him. FINALLY I was allowed to go over. I sat in a wheelchair and David took me over. 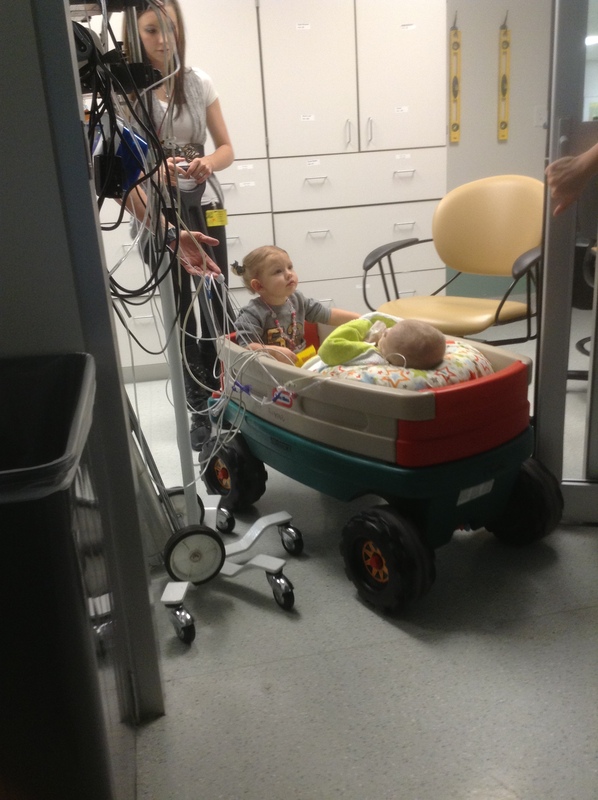 He wheeled me into the Cardiac Intensive Care Unit and over to Ollie’s room. A nurse greeted us. I slowly got myself out of the chair (its hard on your body to have a baby) and walked to his bedside. He was beautiful. I touched his hands and feet. I couldn’t hold back the tears. I finally got to see this baby I was so terrified to meet. He was perfect. He looked healthy and strong. We stayed with him for an hour and then I went back to my room to rest. Later that day my brother that lives in Texas unexpectedly showed up at the hospital! My whole family had come to see this new baby! I was so grateful. I could not have made it through this trial without them. I saw Ollie one last time that day before retiring to my room for the night. My mom was kind enough to stay with Ollie his first night in the CICU in a chair that didn’t even recline. I hated the thought of him being all alone and I was comforted by the thought that he would have his Grandma with him. 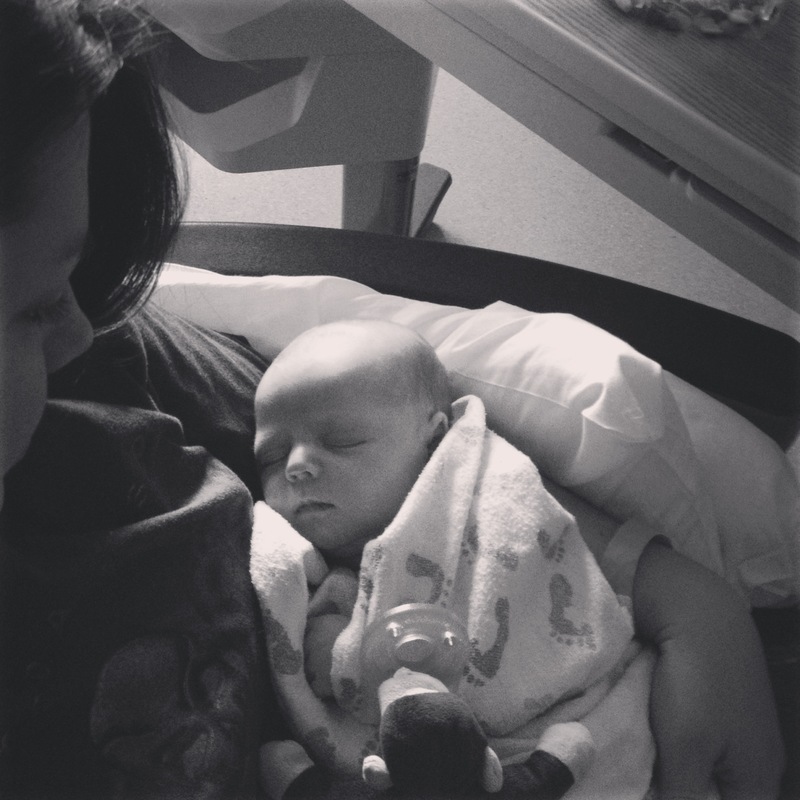 Here is the back story on why I didn’t want to have an epidural: I knew that this child would have some form of surgery after he was born. In my studies I learned that babies can be affected by the pain medication mothers take while laboring. I didn’t feel good about our baby having pain medicine from me and THEN medicine after he was born. I wanted him to be alert and ready when he came out. Also, if he wasn’t going to live I needed to be on my best game. I needed to be able to walk so I could be by his side. I wanted to be able to see him, hold, him, and touch him. I didn’t know if I would be able to do this with an epidural. It was weird that I even wanted to attempt this, because I was planning on getting all of the drugs I could get up until I found out I was pregnant. I had never dreamed of trying to have a baby without. I now feel that I was prompted to try because of the anatomy of my back. I got what is referred to as an intrathecal epidural. It caused spinal fluid to leak out. The result is a headache. Not just any headache. A horrible one! The only way to get relief is to lie flat. My sister Abbie had a similar experience after having her second child. 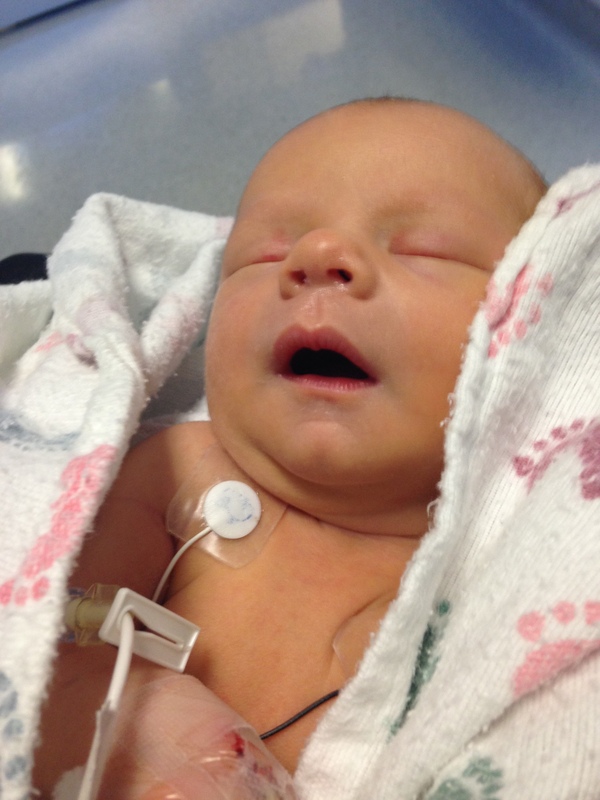 As you heard by my story…I ended up getting the epidural anyway and I wish I hadn’t. I got to add headache to my list of things to deal with for the coming week. These are my views and opinions. I do not look down on any method of birthing or birth plan. Each person needs to pick a birth plan that works for them! Also…be open to change…mine changed!